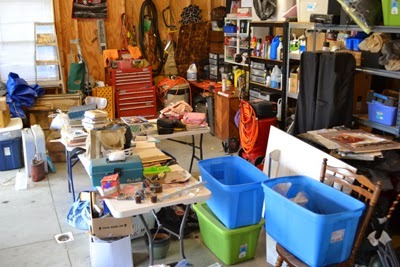 Little House Home Arts: Progress Continues...Junk or Priceless Treasures? Bits of space and floor are now showing! Progress continues on the Steve N. Garage and Kitchen Drapery Project, though I have added still more windows and curtains to be washed and pressed before his visit on October 11th. I have a strong aversion to cleaning and so I am not going to waste a visit from a friend to become a big incentive to do what I otherwise procrastinate doing. 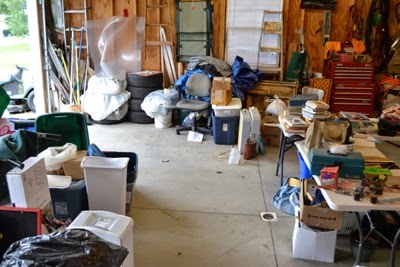 Organizing and sorting has been no small job! Soon, more pegboard up and equipment hung on walls! 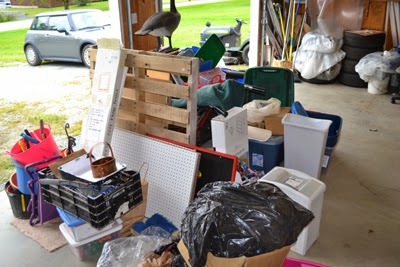 Today I was to sort through boxes of my stored "junk" that made it to the garage when our storage sheds collapsed a few years ago under the weight of too much snow, and ran across The Scarecrow Doll from the Wizard of Oz. In one of my last office nursing jobs, I was teased about being scatter-brained and forgetful. This is not a good trait for a nurse to have, but per my style, I learned in my family of origin, if I am to be ridiculed about anything, I will "make fun of myself and run with it". It is a defense mechanism I perfected when I was young. It hurts less to be in control and beat others to the punch line, or so I used to think. 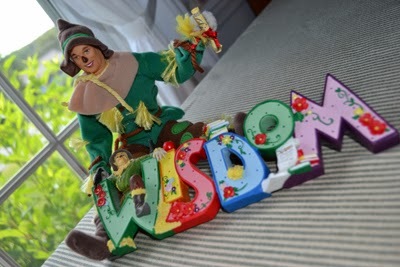 Gifts given to me, The Scarecrow of Little Brain, but getting wiser all the time! Being less than clear-brained and seeing others noticing what couldn't be hidden, I took to singing the song, If I Only had a Brain. Taking on the persona of The Scarecrow from the Wizard of Oz, I made fun of myself. Its effect soon rippled through this private doctor's office. Our aide, in search of a home became our Dorothy, needing to wear and click her red shoes together to find her a new home. Our secretary in the office was the person that had to "get hard to collect on past due payments". She became our Tin Man in need of a heart while doing her job as many saw her as quite heartless. Then there was our nurse leader who trembled at the thought of taking difficult messages between patients and doctors. She needed all the courage she could muster, like the famous Scared-y-Cat Lion. We all had our weaknesses, and soon we were given gifts collectively by the other staff that represented our individual issues. Mine were as shown above, the doll and the plaque that read, Wisdom. I didn't come to know until later how spot on I was that I needed clearness of thought, for I had much "brain fog" caused by Chronic Lyme Disease, and only three years ago suffered a stroke and at the time brain scans noted several brain lesions caused by my what was later diagnosed as Chronic Lyme Disease. These tests documented what had been issues for me that were beyond my control in the years previous.. Fortunately my stroke's damage was only temporary, except to my psyche that now lives in fear of having a more serious one. Finding my Scarecrow Doll, given to me by this office staff, served as a bittersweet reminder of the issues that I have had to deal with both physically and mentally, no matter how ineffective I might have done so.. I have suffered from a chronic infection that affects my brain. We all have issues that we have to deal with and though ridicule is not good, humor helps. The late Joan Rivers reminded us all that "anything we can joke about, we can deal with", and her life was proof of that! Should we all realize that our individual differences are likely there for a reason and whether we understand them or not, we have to deal with who and what we are. The rest of this story still pains me....I went on to be fired from this job. The backbiting that ensued in this office took its effect on us all. I was accused of being lazy. A new schedule had meant not being at my desk and so my desk didn't just appear to be unoccupied-- it had been for days, though by a design that wasn't mine, and my naps in an exam room during my unpaid lunch hour were desperately needed to do the extra long ten to twelve hour work days that my body didn't tolerate. My at-home time in those days included caring for my declining mother as well as my family. I was anything but lazy and I let my doctor bosses know it in no uncertain terms! I had never been one to "talk back" and I regretted this "loss of control of my tongue". I have since realized that my final words were "straight and honest". I was NOT lazy, but VERY hardworking and the work days were not just too hard for me, they were illegally too long for the staff but not the doctors and being misjudged, and treated with prejudice that stemmed from "talk behind my back", it was truly time for me to move on. I still would like to think that my loss was less than their's, though the betrayal of what I thought were good friends was most painful and truly the job market seemed to go from the frying pan into the fire for me. The life lessons I learned from this were good, however, and remain with me always: judging others needs to be done with careful consideration of all the facts, not rumors; backbiting is never OK and neither is abuse from those in authority. Respect for oneself is critical and there was wisdom in my spontaneous defense, though I didn't think so at the time as it was less than eloquent and clear. Unfairness is hurtful and damaging, and it was truly time to leave, no matter the inconvenience to me. Kindness is always appropriate in dealing with others, as we don't know their serious underlying issues. Giving more thought before I speak, no-matter-what-the-circumstances continues to be a lesson I need to work on. I of course I am not perfect, and my memory continues to be weak and so my Scarecrow Wizard of Oz Doll along with my Wizard of Oz Wisdom sign will now be prominently displayed to remind me that some experiences and lessons are just too valuable to be thrown away! Labels: Life lessons; painful lessons part of acquiring wisdom; Incentives to tackling big home projects.